In vivo imaging created with multiphoton fluoresence miscroscopy is a valuable research technique, allowing scientists to measure the function of the live kidney in real time. 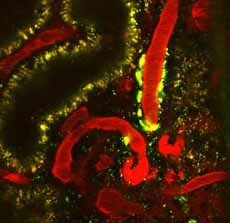 In the movie below, a yellow-hued fluid marker is processed by the rat kidney, illustrating renal clearance, glomerular filtration and tubular transit. Above, we can see the permeability within the glomerulus, the filtering unit of the kidney. Diseased, sclerotic glomeruli appear on the left and right of the photo while a hyperfiltering glomerulus is depicted at top center. The intense ultrafiltration of the high molecular weight red marker fluid appears as a thick red mass within the filtration space (Bowman’s space) in the sclerotic glomeruli – a noticeable contrast to the appearance of the hyperfiltering glomerulus. The photo below depicts the pro-hypertensive hormone, renin. Circulating plasma is shown in red, while the individual renin granules are shown in green. 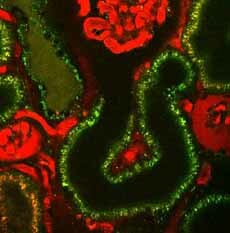 Note the significant green renin content in the wall of the blood vessel leading to the glomerulus. Photos and video reproduced with permission of the American Physiological Society. Published in the American Journal of Physiology – Renal Physiology.